Discover the sweetest side of the Eternal City! Food is the biggest proud of Italians. We are appreciated all over the world for our delights…try to believe! Unconventional Rome Tours has selected – only for you – the 5 best places where you can taste the most delicious snacks of your life! The Tiramisu is the king of Italian desserts, the symbol of the Made in Italy. It is an exquisiteness you cannot resist! This little shop is the perfect place after having wondered through the suggestive alleys of Trastevere. Tiramisù Trastevere offers a great variety of this famous dessert and the tastes it proposes are endless. It won’t be easy to choose: you will want to try all of them! The master patissiers – who will prepare your Tiramisu right in front of your eyes – have defintely unleashed their imagination. Pan di stelle & Nutella; White Chocolate; Fresh Strawberries and Bronte pistachio; Oreo & Nutella; Strawberries and dark chocolate; Tiramisu crumble; original recipe with almond; Pistachio and dark chocolate…and if you also want to discover the delightful tastes of Southern Italy, they propose the Babà and rhum variant. A triumph of tastes from Naples! Do you want to taste one of the most famous Italian desserts? 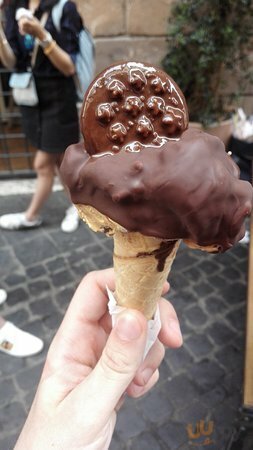 You have strolled through the streets of Rome with your guide and now that you are in Piazza Navona you want to eat a delightful gelato? We have found the perfect place for you! Gelateria Frigidarium is a little ice-cream parlor where old and new come together and create something unique! Forget the same old tastes and the “standardized” gelato! You won’t find a better Gelato in Rome! They will guide you through a real journey among the most creative tastes. “Mukkotta”, “Crema fiorentina”, Rose buds, Goji berries, Saffron and many others…a culinary adventure for the lovers of unconventional and unique experiences! Who said that all snacks have to be sweet? Italians are crazy for salty snacks as well!! In the heart of the city, after you have visited Rome and you have shopped in Via del Corso, you will find Gino 1950. It is the best take-away pizza maker! The specialty here is without any doubt the everlasting Italian pair “Pizza & Mortadella“, but you will also find “Caprese “(mozzarella and tomatoes), white pizza or the delicious “Pizza & Nutella“! Another master ice-cream maker in Rome is defintely The Gelatist in the city center! This gelateria takes ispiration from the USA and their creative tastes and combines them with the Italian tradition. Here, you will find original and creative gelato tastes like Cheesecake & Chocolate, Snickers and Kit Kat. But there’s more! Gelato isn’t the only specialty of this place! You will taste extraordinary waffles, crepes, smoothies, pancakes, banana split and frozen yogurts made with the best made in Italy ingredients! The paradise of gluttons! This is the perfect union of the “tramezzino” (a triangle-shaped white-bread sandwich) and pizza – no explanation needed in this case! In the heart of Rome, in Ponte Milvio, you will find this unique Italian creation with many tastes ready to be eaten. “Cacciatora” Chicken, Parmigiana (a typical Italian dish with eggplant and mozzarella), Misticanza alla Romana (Roman mix), Meatballs and other delicious Roman and Italian delights! What are you waiting for? Go and taste these delights and let us know if you liked them in the comment below!